Following on from my note last week on the history of W Bill, here’s some information gleaned on the history of Smith Woollens. For many, including my tailor, Smith’s is a brand they swear by. Worsteds that are often a little bit pricier than their competitors but with a smooth finish that is instantly identifiable. The one bespoke suit I have in Smith’s cloth – a navy small-scale herringbone – backs that up, with a softness and handle that seems to be unrelated to any question of thread count or fineness. Smith & Co was founded in 1921 by Herbert Smith and Claude Graham. After a few years Herbert Smith decided to pursue other interests and Claude Graham was left to build up a business which is now 89 years old. The heart of the textile industry lay in Golden Square, London where Smith Woollens had a small warehouse and office. From very early, 1930, the company started exporting to Denmark, Sweden and Norway. In the forties the US became a big market, followed by Switzerland, Germany, Belgium, France and Italy. In the fifties South America, the Middle East and Japan were gradually added to the customer base. 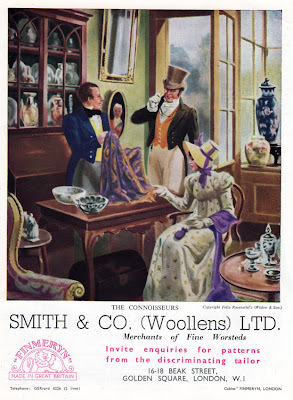 In 1994, Smith Woollens acquired William Bill of Bond Street which, as we know from the previous post, is one of the oldest woollen merchanting businesses of all time, founded in 1846. It specialises in tweeds and cashmeres for jackets and topcoats and has traded extensively in Japan, Italy and the USA from 1945 onwards. 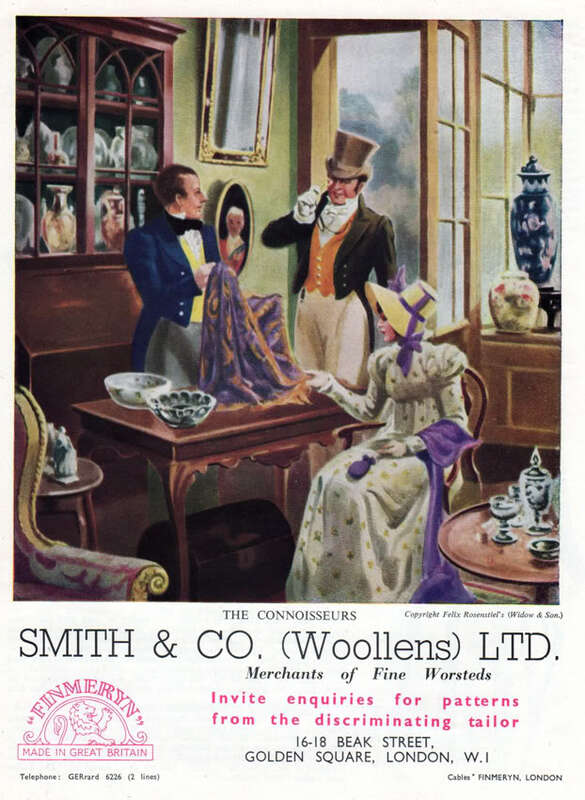 Despite changes in the industry that make many aspects of the cloth business uneconomic, Smith Woollens is still exporting fine materials the world over and is the last of the famous West End merchants to have not one but two cloth warehouses within 500 metres of Savile Row, where deliveries are made daily. Smith’s supplies a lot of haute couture too, both men’s and women’s. Cloths have featured in the Balenciaga, Hermes, Yves St Laurent, Gucci, Hardy Amies and Stella McCartney collections. Unsurprisingly, Ralph Lauren and Paul Smith are also customers. Recently, cloth has been supplied for James Bond films and the Harry Potter series, and many theatre costume designers source materials for their productions in London as well as throughout Europe. You can follow the discussion on The reputation of Smith & Co by entering your email address in the box below. You will then receive an email every time a new comment is added. These will also contain a link to a page where you can stop the alerts, and remove all of your related data from the site. Simon, I hope you follow up this entry with more on Smith & Co. (Wollens) Ltd. to make up for the firm’s lack of a Web presence. Even across the barrier of pixels and bits through a server that separates me from the actual cloths of Smith & Co., I get an irresistible urge to touch the material seeing pictures of it. I have a cream lambswool twinset size 42″ bearing the label in both pieces ‘W BILL, Old Bond Street – pure cashmere’, in perfect condition. I would be interested to know if it was produced before W Gibb was taken over and if possible, the date created. Can you help please?